Boooo Who wants to mod sims 4? Sims 4 has no features as it is. Update this mod or take it down lest i report for uploading a program that doesnt work. I was actually able to get this working again after decompiling and tweaking the few issues that had it choking. I tried sending a PM to FordGT, but got no response. I'd love to share, but want to make sure I get the thumbs-up first. Doesn't work. When I run it, it shows in task manager that it's running then it closes by itself. he left for the sims 4 as he said. I don't think sharing would be bad then, and you would help lots of sims 3 player. Just share it! It's ford gt's own fault that he's off to work on the crappy sims 4 game. If he wants you to take it down after, then obey. But i can guarantee that he will not notice if you share it because he is too far gone to the dumb side of the sims franchise. I'll clear it with site mods, first. Hopefully, I'll have something up soon. Thank you dude. My game's been crashing a lot lately and I need to figure out why. Hello, This is your resident me! I am awesome, like the awesome Prussia! It's in the moderation queue now. If approved, you should see it in the next few days. So...I'm curious. I got the cause "Incorrect Executable - Expecting ts3w.exe. Got: TS3.exe." I've already disabled DEP, but it's still saying it. Is anyone else having this issue? Did anyone figure out how to fix it? My game crashes ever half hour to hour with this problem. 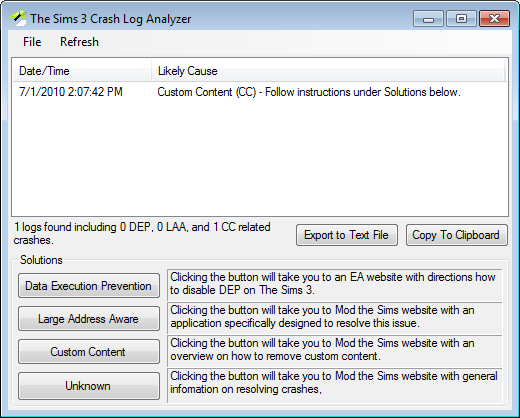 Crash Log Analyzer has been updated to support 1.69.43 of the game. Been having a lot of issues with Sims 3, I hope this can help me run down some of them. Thanks!